It is of utmost importance to always use the latest version of WordPress. When using the latest version of a software such as WordPress, you will benefit from a number of new features, have a more stable and better support product. Most of the times, when WordPress releases a new version of their blogging platform, they also address a number of security issues. Many bloggers are afraid to upgrade their WordPress installation, thinking that the WordPress upgrade process is difficult, or that it might break their website or blog. The best and easiest way to upgrade your WordPress blog is to do it manually. I have seen cases where WordPress upgrades failed, especially automated ones. That is why it is important to make a manual WordPress upgrade. This easy to follow step by step guide will explain how to upgrade WordPress manually. Upgrading WordPress should only take a couple of minutes and is a straight forward process. In case you encounter any problems while upgrading your WordPress, would like to make an offline test upgrade or need professional WordPress support, get in touch with us. Before attempting to upgrade WordPress, always backup your WordPress website or blog. There are several methods how to backup your WordPress installation. You can do a manual WordPress backup, or else you can a WordPress backup plugin such as BackupBuddy, or an online service. Download the latest version of WordPress from http://wordpress.org/download/. If it has been a long time since you last upgraded your WordPress blogging platform, most probably you have a very old version. In this case do not upgrade your installation to the latest stable version directly. If the latest stable version of WordPress is 3.4.1 and you have version 3.0, to avoid having problems and website downtime, first upgrade to 3.1, then to 3.2, then to 3.3, then to 3.4 and finally to 3.4.1. You can download all of the WordPress official released versions from the WordPress release archive. Once you download the archive, extract all the files. WP White Security admin tip: The WordPress upgrade procedure is always the same, irrelevant of which version of WordPress you are running. Note: In the root directory of a WordPress website there might be other directories or files which are not created by WordPress, such as images you might have uploaded and other external scripts. Do not delete such files from the root of your website. As a rule of thumb, most of WordPress files in the root start with a ‘wp-‘ prefix and have a php extension. 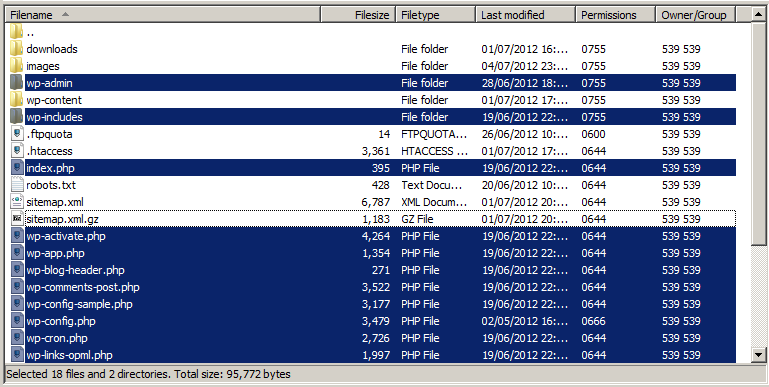 There are also the files index.php and xmlrpc.php. Once you delete the online directories and files, upload all the files extracted from the WordPress download EXCEPT from wp-config.php and wp-content directory. The wp-content directory contains the WordPress themes and plugins, and the wp-config.php file contains the database connection information, thus it is important not to overwrite such directory and file. Once you successfully upgrade your WordPress installation to the latest version, you can navigate back to the wp-admin section and login. WP White Security Security Tip: The upgrade.php file in the wp-admin directory is only used once during the WordPress upgrade process. If the upgrade was successful, delete the file upgrade.php. Well, i don’t suggest installing the latest wordpress once it was released. Id’ rather wait for few days. Normally the newly released version is a bit buggy or security issue, and there’s a fix come out in few days. @Steven: If the latest version addresses security issues, then it is very important to update ASAP. That is why we recommend to make an offline upgrade first, before upgrading the live website, so to make sure the upgrade does not break anything. I think many people aren’t sure how to backup their MYSQL database, and maybe this is why they are hesitant to upgrade WP. I’ve always run a simple plugin called ‘WordPress Database Backup’, and I set its schedule to send the backup xml file to my email once a week. Too easy, and I can then backtrack at any time if something goes wrong. Agreed. The plugin you mentioned is a good solution as well. Though keep in mind that one needs to backup the files as well, especially in case some files have been modified. We will soon be publishing some articles on how to make WordPress backups for free in minutes. So stay tuned and thanks for following. This is one of the best articles on updating WP I’ve read. So many don’t mention the WP upgrade script. I couldn’t connect after my upgrade, but after running the script, I was in. Thank you!